This listing includes the original game CDs. On-screen printable manuals are also included. The boxes are pictured for reference and not included. Every so often a game comes along that seems to grab you in such a way that you simply cannot pull yourself away from the game. You keep telling yourself that you will go to bed after the very next turn, but before you know it, it is 3:00 a.m. and you are starting to figure out how much work you can miss the next day. Master of Orion has been termed 'Civilization in Space' because of the similarities in their designs, the term is also fitting because of the addictive nature of both games. In Master of Orion your goal is quite simply to conquer the galaxy. It is a game of space exploration, economic development, resource management, diplomacy and warfare. It combines the best elements of other space strategy games of the time such as Reach for the Stars, Armada 2525, and Spaceward Ho! without any of their weaknesses. Orion has great depth and richness, and the design is elegantly balanced. It is quite simply the best game of its type that had been published in the 90s. To keep up with the galactic Jones's it is not enough to colonize a lot of planets. It is important also to engage in technological research to keep the competitive edge. Money spent on technology can be divided up into six areas: computer, construction, force field, planetology, propulsion and weapons technology. Players start out at level one in each area and will make discoveries over time as money is invested. There is a lot of variety in the types of advances that can be researched, and care must be taken to choose the right developmental path, both across and within each area. For example, if the initial strategy is quick expansion, it will be more effective to spend more money in propulsion than in the other areas. It is clear that a lot of thought went into how technological advancement works. Almost all areas of the game are affected by technological development. However, advances are not simple linear combinations, where a level 8 engine is four times as fast or powerful as a level 2 engine. Instead, each area is remarkably diverse in what can be discovered. For example, various planetology advances will allow colonization of different types of hostile ecosystems, development of biological weapons, implementation of planetary terraforming, and increasing the efficiency of ecological restoration. Master of Orion 1 is an exciting, fun game that even today will keep you coming back for more. If you are like me, once you start playing Orion you will be staying up late, trying to figure out the next grand scheme to become the sole emperor of the galaxy! Since I was a child, I wanted to rule the galaxy. 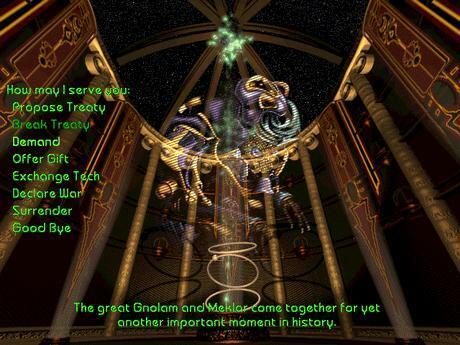 The first time I proclaimed myself galactic emperor was while playing the original Master of Orion. 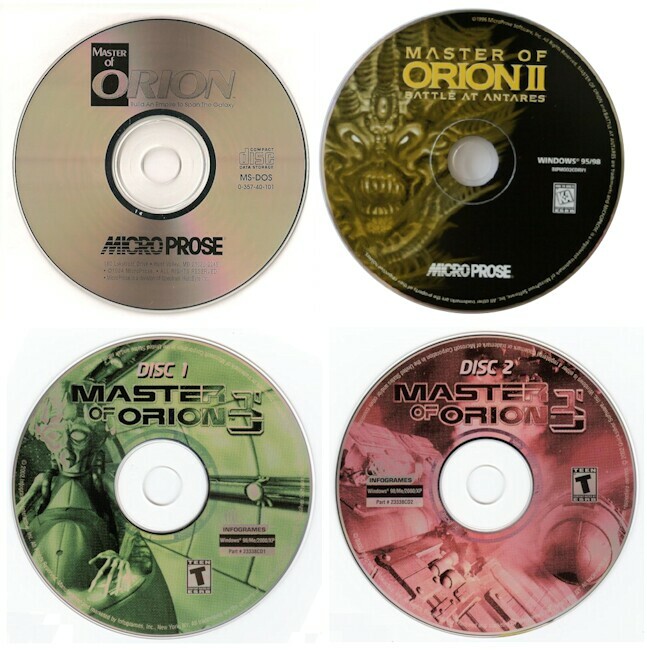 With addictive gameplay, Master of Orion became the most common program to run on my computer in 1993. SimTex took its time before introducing the sequel. The question is: was the wait worth it? I received a surprisingly mixed answer. The surprise is, SimTex's implementation has both good and bad features, but in areas I did not expect (more on this later). Master of Orion II is like Civilization. Rather than take over the world, you focus on the galaxy, taking worlds instead of cities. You pursue technologies, employ strategic fleet deployments, and engage in diplomacy. You will find similar design and scope in Empire, Civilization, Ascendancy, and Spaceward Ho, other games of the era. As you can imagine implementation is often key to a popular strategy game and SimTex did a fine job with this sequel. Master of Orion II is enthralling for the same reason as Master of Orion I: The game has depth, allowing players to explore many avenues to success. Players might opt to win the game diplomatically, deviously setting all other races at each other’s throats. A more obvious method to win is through brute force using starships to subjugate the other systems. Along the way players make tough decisions to balance industrial output, research and food production. What technologies are keys to winning the game? Which race has the best advantage? How does one negotiate with hostile races? There is no single right answer and therein lies the success of Master of Orion II. Stategy gaming from the Orion II era, and earlier, was often be an awkward hybrid. It was almost assumed that visual effects will be poor, but the game engine and AI will be robust. This is dangerous mindset for a game company. A solid design is crucial in making a popular strategy game because the engine, with its comprehensive and exacting rules of play, is accessed via the design! Gamers do not have access to a title's source code and will not see good programming in action unless it is part of the game itself! SimTex is not a foolish company. The decision to incorporate 345 megs of art from the game CD was done to bridge the chasm between good game design and visual appeal. In fact, this was expected. 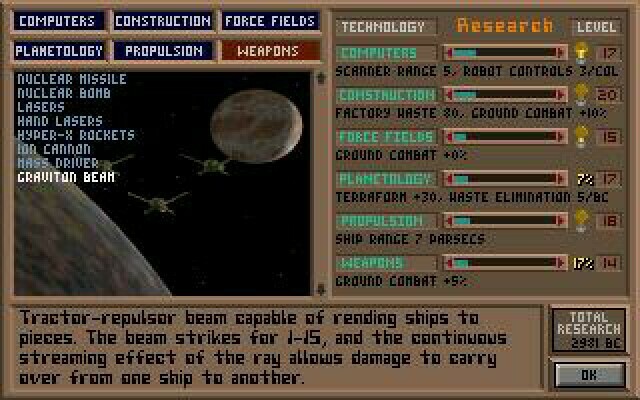 Players of both Master of Orion I and Master of Magic roundly criticized SimTex for the sub-par graphics. With the release of Orion II SimTex demonstrated a capable art staff. SimTex took a big step forward with music and graphics in Master of Orion II. This effort leaves all their previous work in the dust. The music is comparable to the quality work found in a serious competitor -- Ascendancy. And while Ascendency’s art was more creative, Master of Orion II sports more graphics, so you do not feel as if you are looking at the same place throughout the game. With all the complexity of integrating vast fleets, armies, and planetary systems into a machine of conquest games often run long and hard. There are few objections to the time involved. Who wouldn't want to obliterate all traces of the bitter enemy? Master of Orion II fits the bill quite nicely. The long-awaited follow up to the "spaceploitation" strategy classics Master of Orion and Master of Orion 2, MOO 3 attempts to combine unprecedented depth with user-friendliness in one ultimate "4X" gaming eXperience. The basic game formula is the same, though: start out with one planet, eXplore the galaxy, eXpand by founding new colonies and bases, eXploit resources, and then eXterminate your opponents--or at least show them who is boss! Many years in the MOO timeline have passed since the last installment of the series. The Antarans have triumphed and imposed their rule on the Orion sector, even dubbing themselves the "New Orions" in their pretentiousness. Most of the old alien species have been defeated and nearly exterminated by the New Orions, but a few remnants of their civilizations still remain as non-playable races, so you will occasionally come across the odd colony of the Darlok, Bulrathi, Alkari, Mrrshan, Elerian, or Gnolam variety. The 16 playable races that have survived the wrath of the Antarans include the insectoid Klackons and Tachidi; the reptilian Raas, Sakkra, and Grendarl; the fishlike Trilarian and Nommo; the robotic Cynoid and Meklar; the humanoid Human, Evon, and Psilon; the crystalline Silicoids; the ethereal Imsaeis and Eoladi; and the genetically-engineered harvesters, the Ithkul. Management is handled primarily at the imperial level through general plans and policy decrees, with a system of AI viceroys assigned to doing most of the grunt work in managing the various regions of your colonized planets. Up to four great leaders at a time may come forward and join your empire, adding bonuses (and perhaps also penalties) to your base racial abilities. Research is divided into six schools: economics, energy, biological sciences, social sciences, physical sciences, and mathematics; some 380 technological advances are available overall, and not all will be available to your chosen race. Ship and ground combat have both changed from previous MOO games. Naval battles are played out in real time, with orders being given to ships assigned to the various task forces you organize before any battles take place. 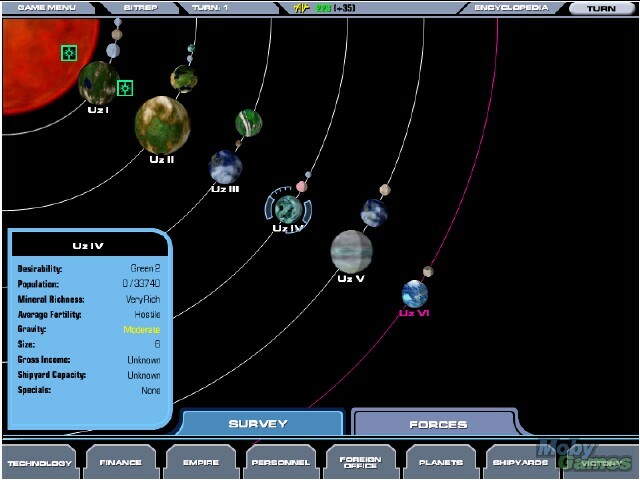 The player now has more tactical options in commanding ground forces in planetary assaults. Espionage is still available for implementing a variety of dirty tricks on opposing empires, and diplomacy is expanded so that you can now negotiate not only on an inter-empire basis, but also through the Orion Senate. With enough votes, laws can be passed by the Senate which have galaxy-wide effects, thus making it possible for the clever diplomat to change the rules of the game to his own advantage. Victory is yours if you can accomplish one of three things: eliminate all opponents and become Sole Survivor, garner enough votes through diplomacy to become President of the Senate, or recover the five mysterious alien artifacts--the "Antaran Xs"--scattered across the galaxy. Just be prepared for a tough fight, because powerful Guardians will once again stand between you and total mastery of Orion.